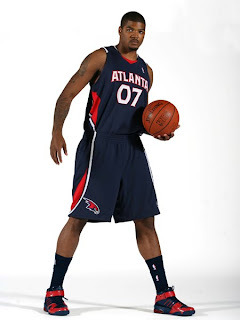 We don't do this much, but we were inspired by Ball Don't Lie's Top 10 Unis from the Past 10 Years to go forward with the rehashing of a dark era in Hawks uniforms. Not bad, still had the Pac-Man on the shorts, but still, what the heck, right? If it ain't broke, etc. 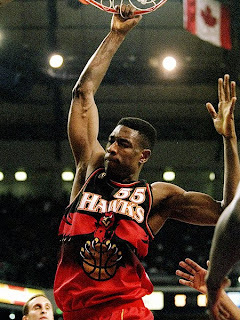 Then, in 1996, the team (in an apparent attempt to commemorate Dikembe Mutombo's presence on the team), switched to the "Hugging Hawk" look. 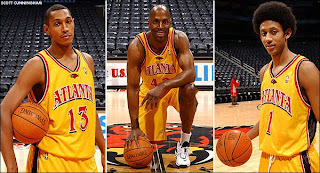 This uniform was a sort of a self-fulfilling prophecy, as the Hawks run of success ended abruptly (about as abrupt as an Isaiah Rider arrival can make it), going 188-386 (.327) until they finally put this bland look out of its misery in 2006. 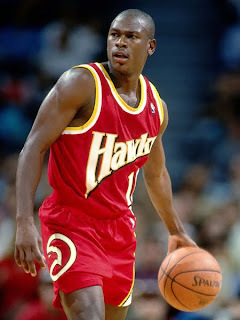 It was during this phase that the Hawks made two---ummm---strong statements with their uniforms. In 2003, they did a series of 70's "flashbacks", including groovy in-game video bits and wearing some of their former uniforms, including the green (uh-huh, green) uniforms that Pistol Pete and Dr. J wore in their glorious two game run together (w/the late Cotton Fitzsimmons as coach) in '74. 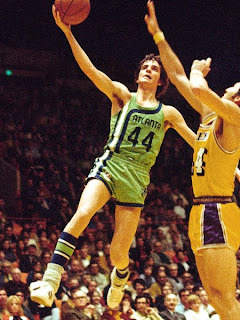 Green Hawks uniforms are one thing--at least Pistol and Julius wore them. But what happened the next year (2004-2005) is something that everyone will remember where they were when they saw them on the court. It was the release of the "McDonald's" uniforms, which were to serve as alternate uniforms for (4) games. The publicity photos are classic, ranging from just happy to be here, I'll wear anything (Willis), Yeah, right (Diaw), and seriously--this is the NBA? (Childress).But nothing compares to the photo of Josh Smith sporting the new duds--something from the Heyaazz No Collection. 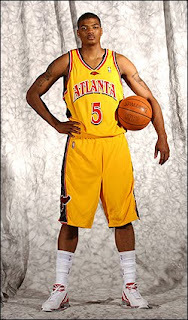 The whole era was such a disaster, the Hawks had to change their whole color scheme in '06. 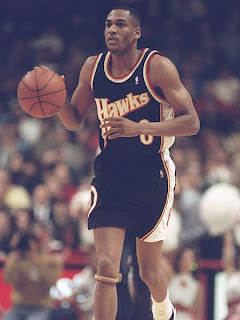 In the end, the Hawks need to follow the NFL's New York Jets and San Diego Chargers and embrace the universally endorsed Pac-Man uniforms as soon as possible. It's tried, true, and successful--and who knows, if they wander any further, we could get a look like this again. THHB is uninspired. Oh, we hear you. How can we not be excited about the announcement of Joe Smith finally chiseling his name on the bottom line for a vet min pittance, wrapping up what has to be described as a fantastically successful Hawks offseason? Well for one, this Smith (Joe, not Josh or Sekou) story has been ongoing since the end of July, making this signing seem more of a conciliatory gesture on Smith's part than an enthusiastic joining of the favorite franchise.Secondly, Hoopinion and Mark Bradley already killed our joy about a fourth big man a while ago--thanks, guys! Third, and perhaps most important to a self-important bunch as ourselves, is that throughout the course of the past few weeks, we have seen more evidence that we pale in comparison to the creative genius going on over @peachtreehoops, the power and brevity in excellence that is @hoopinion, and the commenting activity that persists over @hawkSt8Talk. Seriously, Str8Talk claims they have about a dozen readers, but they have been averaging a robust 215.32 comments per post over the offseason. Amazing. Not even Football Outsiders can break down those numbers with any reason. And all Peachtree Hoops has done this summer is launch maybe the most interesting and engaging series of posts mentioned in this blog entry. Seriously, if you haven't checked into the 72 Reasons Series yet over there, you are missing out. The entry alone on "Heat Checks" made such an impact at THHB headquarters that it's posted on the group fridge with a gold star and a smiley face, with an inside track on the newly created "Most Truth Entry of the Year" for next year's HHBs. P'Hoops brought on two new writers for the purpose of--well--we can't figure it out since the proprietor of the site has used this as a campaign to raise his own game. Well, touch 'em all, Mr. Drew--you're hitting a home run.Well done, sir. Heck, people all over are talking about the Hawks, even some describing how the Hawks haven't done enough to make a push for a championship. Yowza--the Hawks are coming along, eh, when national hoop watchers are debating whether the Hawks standing pat means they won't contend for a championship. Hey, some fans are just happy that the Lottery Land luggage tag is looking older and older these days--while of course longing for more. So Joe Smith finally surrendering to the Hawks offer of the vet minimum (almost two weeks after the story seeped) doesn't really bring us to inspiration. Because with all the other great things happening in Hawkdom, even in the dead of offseason, it hardly moves the needle. Veteran Power Forward signs with the home team for the min that wouldn't have happened even two seasons ago? Meh. What number will Spirit the Hawk be on P'Hoops 72 Reasons or what piece of intelligence will Hoopinion share or who will take issue with Str8Talk enough to provide another commentathon over there? Hey, maybe we are a little inspired. Mike: Okay, so what if I don't want to give up on her? Mike: But you said I don't call if I wanted to give up on her. Mike: So I don't call either way? Mike: So what's the difference? Rob: There is no difference right now. See, Mike, the only difference between giving up and not giving up is if you take her back when she wants to come back. But you can't do anything to make her want to come back. In fact, you can only do stuff to make her not want to come back. Mike: So it's just like a retroactive decision, then? I mean I could, like, forget about her and then when she comes back make like I just pretended to forget about her? Rob: I mean at first you're going to pretend to forget about her, you'll not call her, I don't know, whatever... but then eventually, you really will forget about her. Rob: Mmmm... see, that's the thing, is somehow they know not to come back until you really forget. Hitting the button on the elevator sixteen times to try and hurry things along. Checking online and email every day to see if Joe Smith signed with the Hawks. Now, if this were like waiting for someone to show up or waiting for my food at a restaurant, I would simply slip off to the bathroom, thereby guaranteeing an immediate arrival of the that which I was waiting for previously. If I were a betting man (Note: World's Worst Gambler. 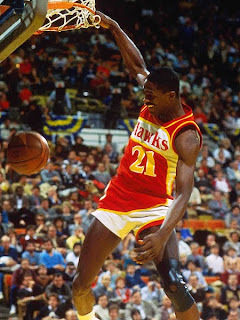 Seriously--like bet against the Globetrotters bad), I would be thinking that maybe the Hawks organization was writing the contract with a hammer and chisel and waiting for Moses to come down from the mountain with the terms etched in stone. Still, you have to believe Sekou Smith when he writes that it's just a matter of when, not if, Joe Smith signs. Don't you? When the news first broke (Actually, breaking may be too strong a word. Maybe drifted in is a more appropriate term) from ESPN's Ric Bucher, we at the HHB immediately stepped into the Cynical Chamber of Wisdom and emerged with visions of a plot by Smith's reps to leak the terms to the other teams in the league, via the media, to let folks know that their client was about to take the veteran minimum in case some other team wanted to chime in and up the ante. The terms do seem a little low for Smith, considering others in his production bracket scored more loot from teams this offseason and the Hawks certainly wouldn't leak a perceived bargain out before a deal was done. But, so far, no takers---but no signed contract either. 1. What a good deal by Rick Sund, scoring the guy they wanted for the vet minimum. 2. Why isn't anybody paying more than the vet minimum for him? We are still optimistic that this will have a positive effect, though we admit it's little more than a placebo potentially at this point given those darn statistics. We'll hold off on a full blown "Smith Signs" piece until the deal is actually done. Ha. We'll not be the ones that people shake their internetty fingers at and say, "But he's not signed!" We'll let others make that ghastly mistake. Last Sidenote: We have been talking about this particular--umm--chase--since the last week of July. Too long! Get it done already, Moses and let's get on with the pan-in-the-face boredom that is summertime in the NBA offseason. Joe Johnson extension? No surprise at all. Bret @ Hoopinion and Drew @ Peachtree Hoops have excellent points about de-emphasizing the role of Joe Johnson on the team moving forward. But for the Hawks to do so would fly in the face of every action the Hawks have taken in the last year. We have long agreed with our Hawks writing brethren that the team would be better served with less one-on-one, isolationist offensive approach, as it doesn't scale to success against good defenses. The Hawks, however, do not see things the same way, as evidenced by their actions ever since they got cleaned out of the second round by Cleve-land. Instead of understanding their offensive inefficiencies and working to balance the team's approach on that end of the floor, the team doubled down on the strategy by trading for Jamal Crawford and drafting Jeff Teague. They also re-signed Mike Bibby to lock down The Backcourt for at least one more season. Even during the season, the team made zero effort towards reversing the flow of the ball to go from the inside-out. They showed almost no interest in improving Al Horford's abilities around the basket during games--some games giving him no plays at all from the post--as if he were a minimum free agent signing of some sort up front. Josh Smith worked hard in the previous offseason to develop his post game, but is encouraged by his teammates, and the team's offensive style to rain jump shots, even though there is a Mt. Everest-esque mountain of statistics that scream not to do so. 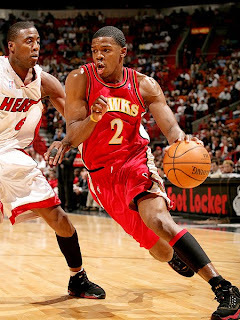 It would be great if the team decided that, in fact, a Joe Johnson heavy, dribble-dribble-shoot approach was better used as a change up, rather than the teams' fastball, but to continue to hope that things will change looks to be a dead end, sadly. So, in those terms, it makes perfect sense that the team is looking to lock Joe down before the influx of cap space and capital invades the conversation in the summer of 2010. Joe is the linchpin of their entire approach offensively--even with his Earl Campbell like workload since becoming a Hawk. Like it or not, this is the path the Hawks have more than made clear they are traveling down--and they are counting on Joe Johnson to lead the way. As for Joe, Sekou Smith (who broke the news linked in the first sentence on his fantastic AJC.com blog) and others have done an excellent job over the past year of highlighting Joe's more than willing attitude to having things continue as is--he likes his role as the main man on the floor--so it will be no surprise to see he and the team comes to terms on an extension, since there are few (if any other than the Hawks) teams that will afford such admiration, attention, and production for Joe next season. The HHB is chanting and meditating for some zen calmness to wash over us, despite the team's obvious warm embrace of an offensive philosophy that is in polar opposite to their own. Suggestions and incense can be fired off in the Comments Area. By now you're likely to have heard and/or read about ESPN's lockdown of their cavalcade of stars from social media such as Twitter, Facebook, etc. Marry that to NFL, NBA, and other pro leagues beginning to take money away for such personal expression that the leagues/teams deem outside their own personal conduct code and we look like we're beginning to see a (hopefully temporary) embargo of conversation coming from those in the sports arena. Teams and companies do have rights to control such behavior, especially when they are doing so in representation of said teams and companies. But to lock down all traffic and communication with the very audience they attempt to reach on an hourly basis is counterproductive to that cause. ESPN won't be able to reach me every minute of my day if they rely strictly on old media avenues (website, TV/radio, print), but they can if Ric Bucher, Mark Stein, Chris Mortensen, etc are tweeting little nuggets and links. Not only that, but the chat-like responses that Bucher has given me in the past has made me MORE likely to read his material, stay tuned for his segments, etc. Bucher never made it through to me as a consumer until I saw the kind of guy he is through Twitter. It elevated his personality with me, added some depth to who he was, and made me interested in what he had to say. Take Mark Bradley of the Atlanta Journal-Constitution for another example. Bradley has long been perceived in the ATL as a sourpuss/negative writer, causing many to believe the long time scribe sneered at the area's sports franchises when writing, showing attention only to level his subject with rotten vegatation. But a funny thing happened in the last few months. The paper opened Mark up to the public via a 3-a-day blog habit, turned him loose to comment on the site and through Twitter, and viola! It turns out that this guy is a good cat after all and, surprise, knows a lot about what he is covering. Mark is among the few newspaper columnists who actually reply to tweets and comments and not just use Twitter exclusively to peddle their work. And, like Bucher above, this changed understanding of Bradley has inspired many people to seek out and participate in the thoughts that Bradley presents on the AJC.com site, gains traffic and attention, and new readers who may have never participated if not for removing the filter of control and limiting Mark to a file photo on a website. As for the athletes themselves, it can truly be home run or strikeout. Some athletes, like Zaza Pachulia and Dwight Howard come out looking great and becomes even more of a fan favorite through their personable personas on Twitter. Others have shown themselves in well publicized and less flattering light. Yes, teams may cringe when they see what's online, but it makes the whole experience more alive and colorful to see who these guys really are. It has given more reason to be excited about the upcoming season and personalized these players in a way that will enhance the game experience even more. There is a lot more love and appreciation for Delonte West after his lightheared KFC joint a few days ago, and there will be people who won't see West as another name on a jersey next season, they'll see a person, and along with other players that have invested with the public this offseason, that may increase enthusiasm to watch the NBA product this year. So ESPN, the NFL, and others can attempt to limit, suppress, or even co-opt the technology for themselves, but there will be an unmeasurable impact to their cause, especially if what is trickled out to the public is a sterilized version of what was once real, vibrant, and unfiltered. It's not going to break them by any means, but they won't be getting into the mindset of this viewer as often as they would like, and therefore, they won't be able to reap the benefits from that quest. The people aren't stupid, they know they like and want--and taking away something they want and replacing it with a washed-out version of it or even replacing it with nothing won't fly. And they leave themselves open to the corners of the space that will. Not that we get too worked up about it, but there are always some interesting items in the schedule every year. Some of these include early season locations, nationally televised games, and big ticket games. We were going to post the schedule for the new season as provided to the HHB by the NBA and the Atlanta Hawks (Thank you! ), but we found the formatting and layout even more pleasing on the official Hawks.com website. Enjoy and feel free to posts your grievances and other associated arguments over in the Comments Area. UPDATE: Just discovered that the Clippers have eight games on TNT and ESPN, one more than the 4th seeded, "up and coming" Hawks. We draw even with them by having one more NBATV game than they do, bringing us both to (13). Ka-chow! MORE GOOD NEWS: This piece on AOL Fanhouse observes that the Wizards also have (8) games on ABC/ESPN/TNT--again, one more than the Hawks on those channels and (16) including NBATV. With the latest in non-Hawks signings this past week, let's take a look at how those moves might impact the Hawks. Obviously, this was good for the Hawks because the main competition for Odom's services was in Miami--fortunately the lure of "riding Kobe's coattails" and being an "apostle" in Los Angeles was stronger than the attraction of South Beach and Dwayne Wade and becoming part of what might be an epic sequel to a "memorable" first round playoff series last year. It's the size of the contract, the 1 year-3 million dollar type, that interests the HHB because such a small deal for a player of Warrick's productivity and youth should positively influence the price range of the Hawks' alleged target, Joe Smith. If the Hawks didn't want to pay Smith the same deal as some of the other players in his price range, then surely a much younger, more productive player getting such a small deal should help the Hawks position. Warrick signed with Milwaukee despite reportedly being chased by the Cavaliers, who may now turn their attention to the services of former Celtic Leon Powe. Powe has the highest PER of any unrestricted free agent remaining unsigned on the list. This hurt for a couple of reasons. One is that is was a very affordable deal (1 year 4.5 million plus incentives) for a player that is still young, very productive, and fills the largest Hawks need (rebounding) and the Birds weren't involved (But CLE, SAS, and CHA were). Two is that it's the kind of signing that teams that are serious about going further in the playoffs seem to make (see McDyess/Ratliff to the Spurs, Marion/Gooden to the Mavs, etc.). While the Hawks are still sitting on their bag of magic MLE beans, the Cavs are racing to sign the last remaining talent on the market that could aid their championship. That the Bobcats were in pursuit of Gooden and not the Hawks tells you what Sekou Smith validated earlier---the Hawks aren't interested in even spending three million dollars on another role player, much less would it would have taken to get Drew Gooden. As it stands, there are few unrestricted free agents of a productive nature left to sign, fewer still that could help in the frontcourt. Your move, Atlanta.